Welcome! If you are new to Decor Gold Designs, I am so happy you are here. 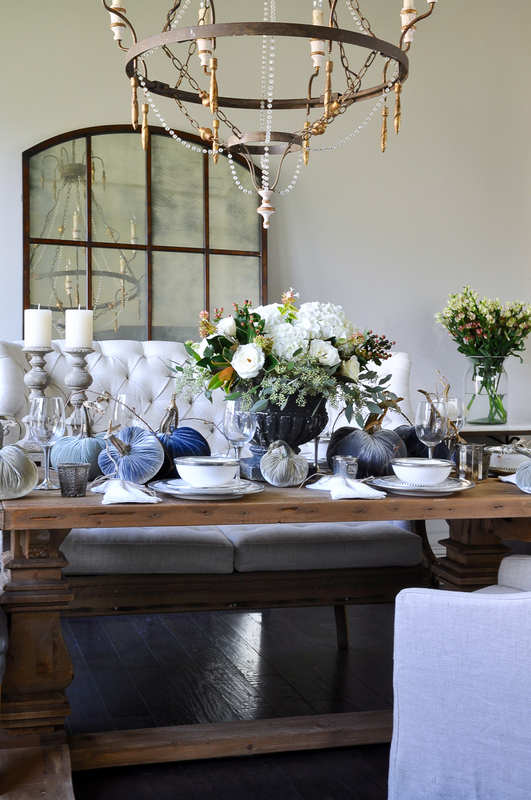 Today, I will be sharing a Thanksgiving table for the Styled + Set Holiday Entertaining Blog Tour hosted by Lory from Designthusiasm. I absolutely adore a professionally decorated table. It is a blank canvas at its base and a fully decorated work of art once complete. If you are a frequent visitor to my site, one of the things you probably know about me by now is that I am anything but conventional. My love of all things pumpkin is well-known within my home. Whether we are talking about pies or cute, little decorative mini-pumpkins, I’m in! 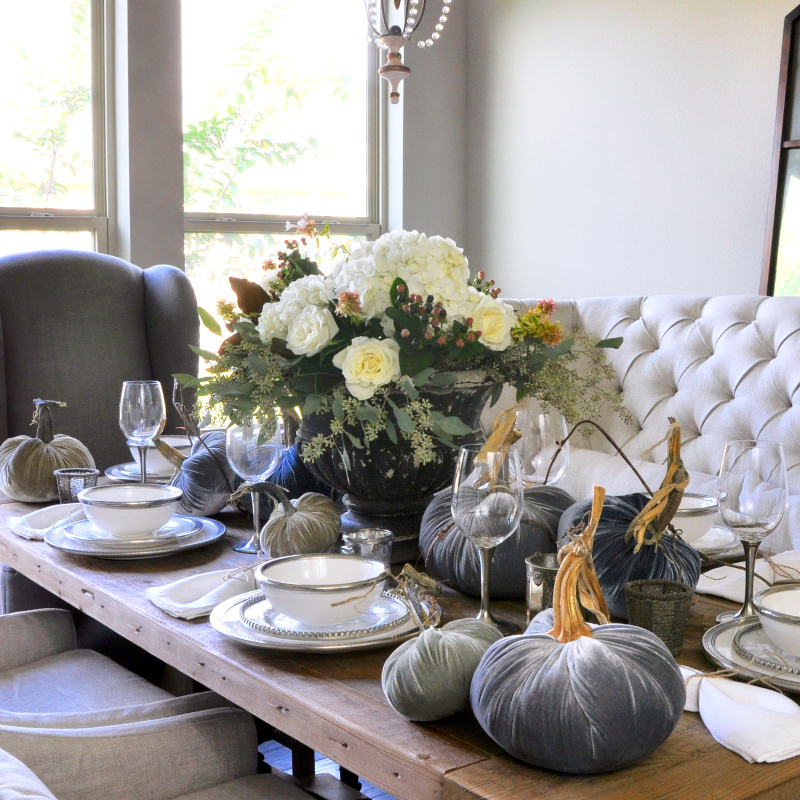 This year, I wanted to offer a different take on a pumpkin themed Thanksgiving holiday table. 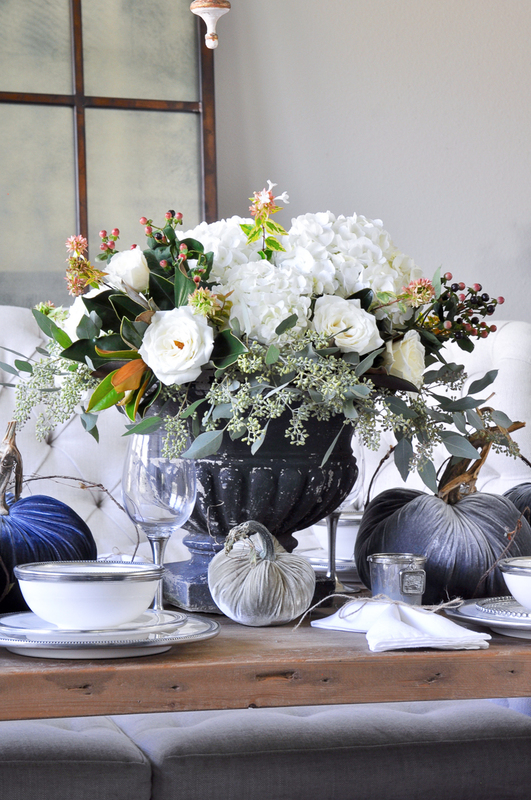 Once I found these beautiful velvet pumpkins by Hot Skwash, my idea came together quite quickly. 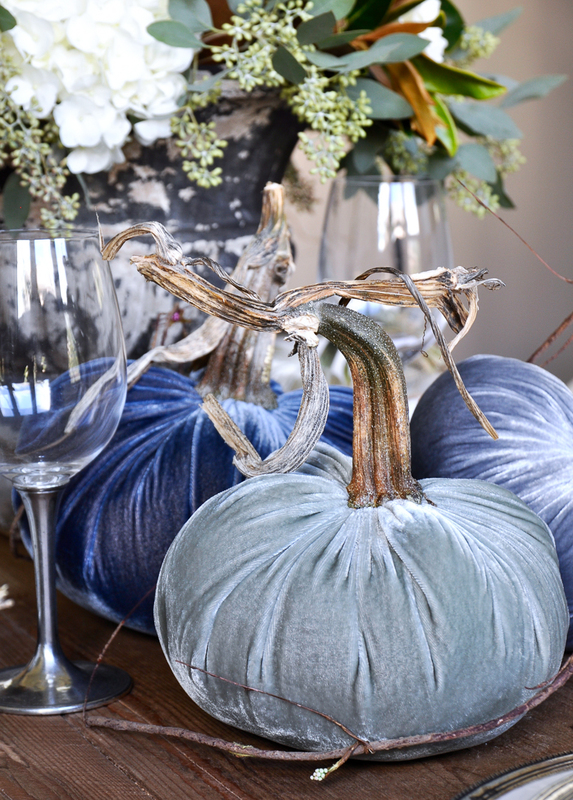 Besides being made of velvet, the sheer variety of their sizes and lengths of their respective vines made this collection of pumpkins my favorite component of this tablescape. I chose to scatter them about to add intrigue to the table. 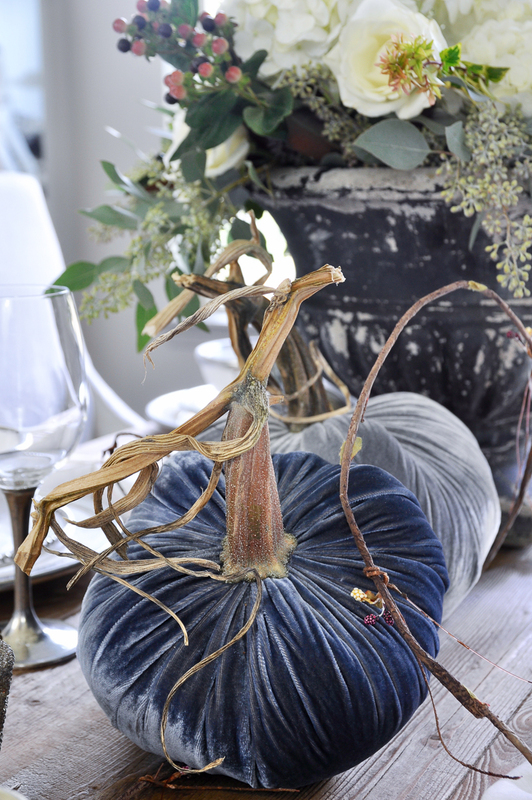 Velvet pumpkins in grays, blues, and sage. Aren’t they adorable? 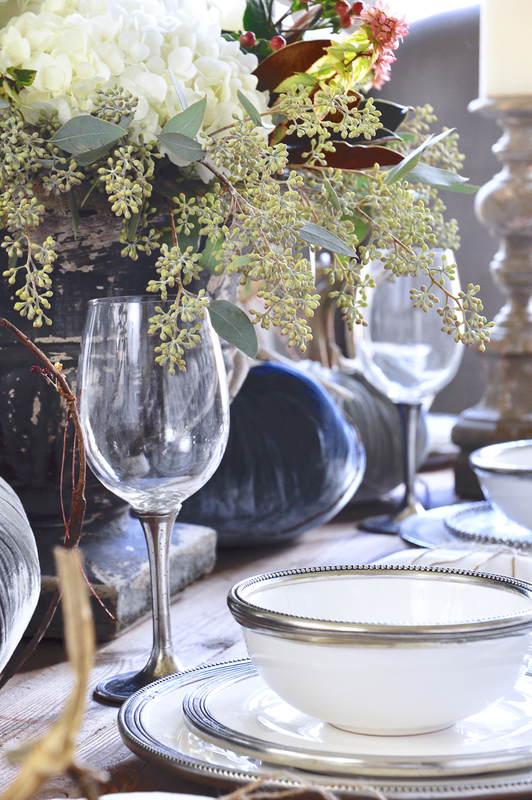 As a family, we love to use the beautiful dinnerware and glassware which adorn this table. We typically use them for special occasions. I just love the holidays! This vintage black urn is from my back patio. My sweet husband transplanted the plant that was in it. (You can see my fall patio here and my summer patio here). 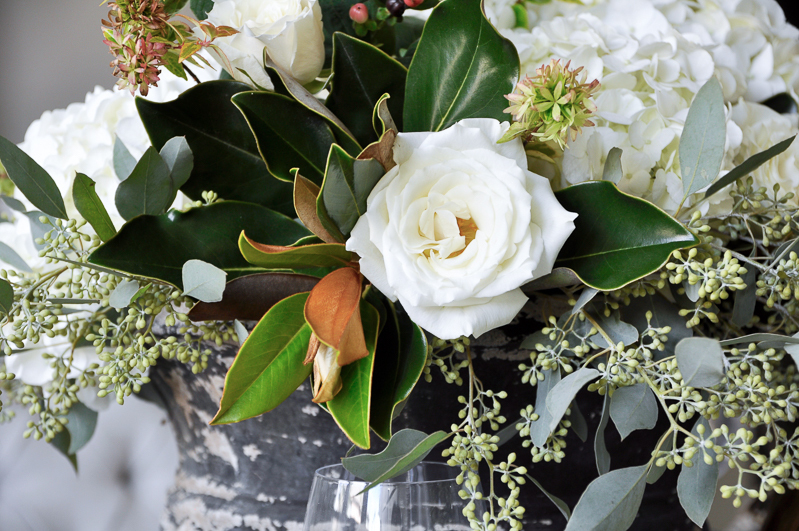 It is the perfect look and size for a statement floral and centerpiece for this table. 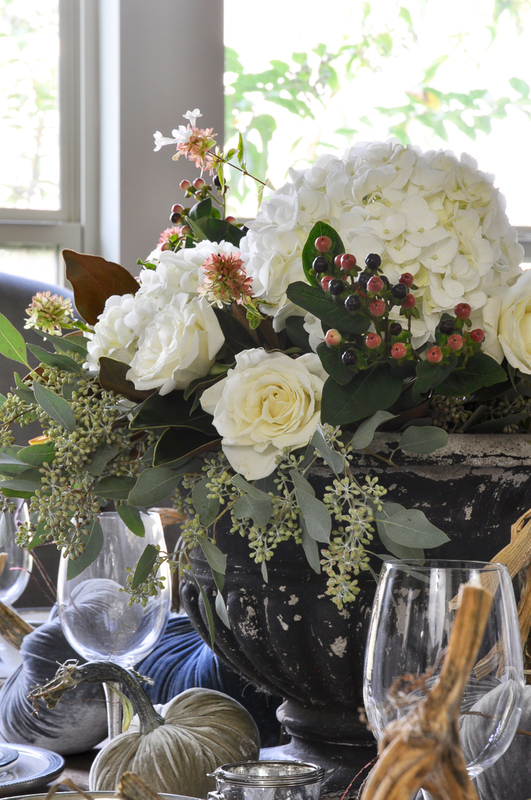 I chose to combine hydrangeas, roses, eucalyptus, and clippings from my yard. 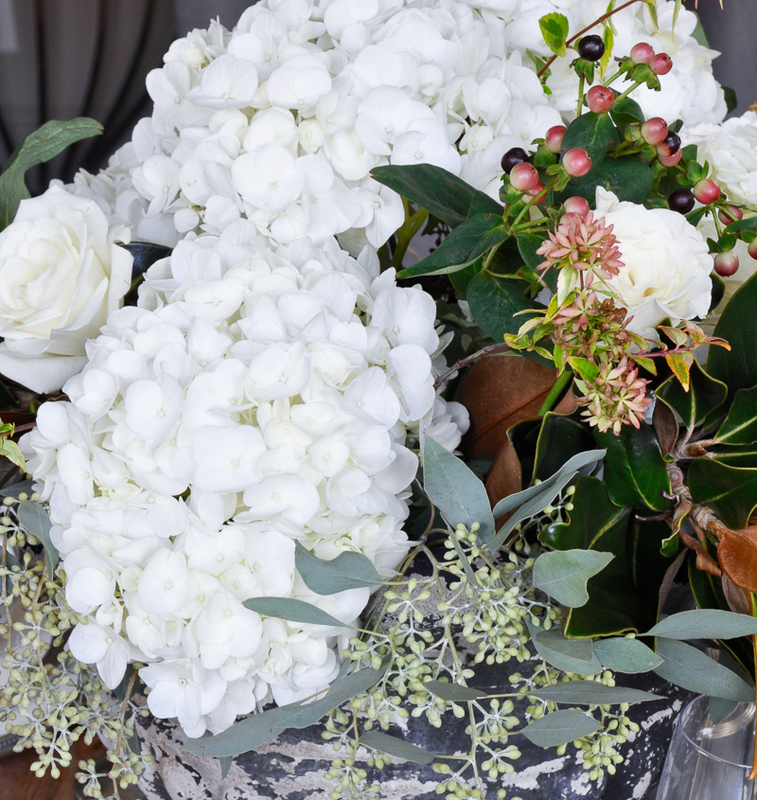 I love the combination of wild and delicate flowers and greenery. I think the berries are my favorite part of the arrangement. They seem to complete the holiday look. Remember, if you are an outside the box thinker, like myself, there are a number of ways to stay true to your creative side while honoring our traditional holiday celebrations at your own family’s table. And if you are more of a traditional or transitional decorative personality, then you’ll have an abundance of options beyond those cute velvet pumpkins. 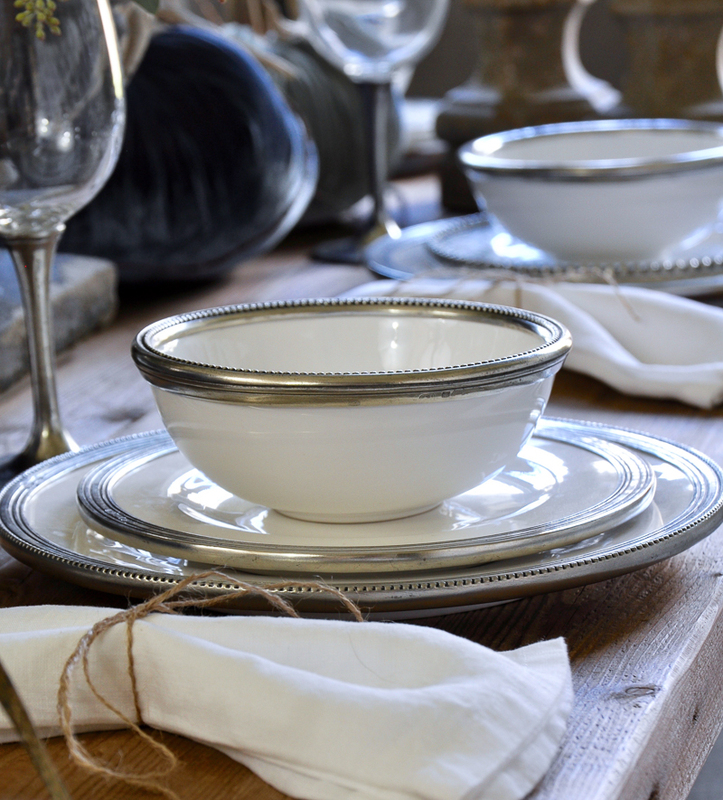 For additional Dining Room Sources, please click here. To tour this room, click here. Thank you for stopping by! If you enjoyed your time here, please consider subscribing to my weekly newsletter. You can find links to the other participating bloggers below. Oh Tam, you are the sweetest! Thank you my friend! That means a lot coming from you! Love your beautiful table Jen!! I also love your take with the pumpkins!! They couldn’t be more perfect and I love the colors you used!! Happy Thanksgiving my friend!!! Jennifer, your table is beautiful. 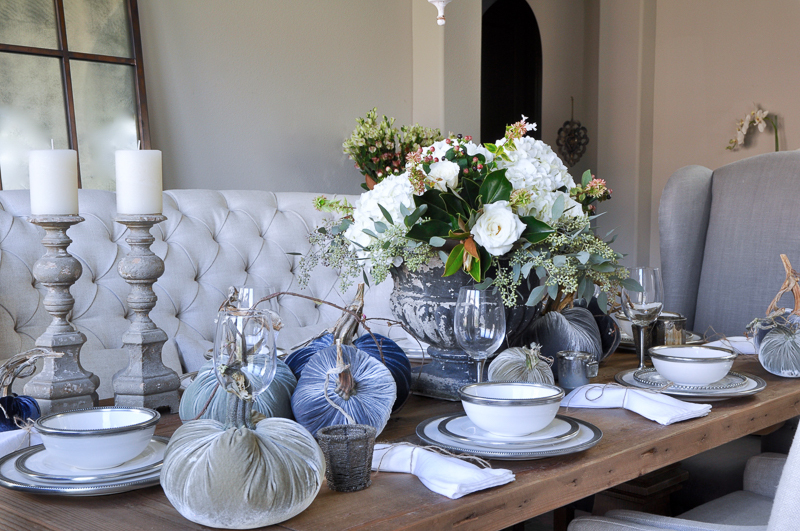 From the dinnerware to the velvet pumpkins and that gorgeous centerpiece. Love your chandie, too! Jennifer your table is utterly magical ! Love it – especially those vine-y pumpkins. Happy early Holidays to you & yours! Holy velvet pumpkins, Jen! I LOVE THEM! And your centerpiece is a work of art. Another killer table, you talented lady! Ah, well that is so kind of you, but you are the master! Love ya! Thank you so much Jamie! What a fun Wednesday group we have!!! Jen this was stunning! 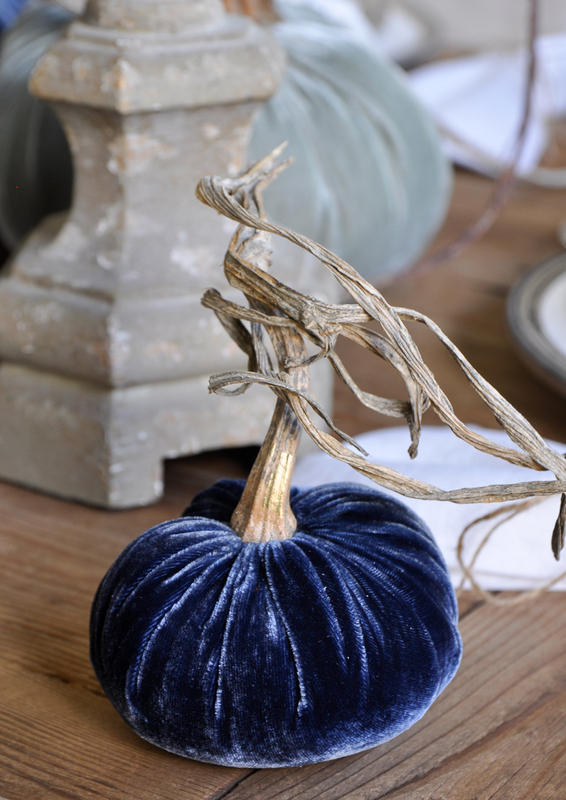 I absolutely loved those velvet pumpkins and the special touches you add to your home. Gorgeous friend!